Lou Reed and the Velvet Underground changed music and NYC. We celebrate Reed’s sonic legacy. While we may have read Brian Eno’s quote about the Velvet Underground a thousand times since VU cofounder Lou Reed’s passing, it still holds true. 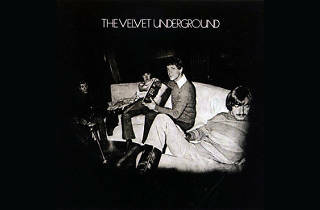 “The first Velvet Underground record sold 30,000 copies in the first five years,” Eno said. “I think everyone who bought one of those 30,000 copies started a band.” Singularly influential, the Velvet Underground changed the sound, feel and look of music—not to mention the sound, feel and look of New York City; Reed is NYC’s patron saint of rock & roll. In his honor, we present a playlist of our favorite artists inspired by Lou. So pull on your leather jacket, take a walk around our great city and steep in the sounds. Modern Lover Richman saw the VU over and over again as a teen. “I’m in love with rock & roll,” he sings on this throbbing track that bottles the Velvets’ “Sister Ray,” shakes it up and cracks it open in the middle of suburbia. If the VU invented NYC rock & roll, the Strokes did a nifty job of reminding the kids why it felt so damn good. These pretty teens in skinny jeans would go on to cover Reed’s “Walk on the Wild Side,” but the band’s breakout album, Is This It, was the real hit. Hypnotic, messed-up vocals; chiming, filthy guitars; and effortless, effortless cool—Sonic Youth’s Thurston Moore said the song was about appointing Dinosaur Jr.’s J Mascis President—make this a perfect part of Reed’s misfit lineage. England’s answer to the Velvet Underground rolled up, eyeliner and all, in the mid-’80s. The duo’s Psychocandy album went on to spawn its own genre: shoegaze. Heavenly melodies spiraled out of crashing dissonance on Mercury Rev’s 1991 debut, Yerself Is Steam, and Dave Baker drizzled his wobbly vocals over the top like they were honey. Bliss. David Berman’s Silver Jews project received a ton of VU comparisons, but this witty, sad, funny number is actually written about Jesus Christ rather than Lou Reed. Perfect, then. A track by new wave icon Ian Dury’s son, “Oscar Brown” wins our obscurity vote for its closing “Sweet nothin’ ” refrain and gloriously dark, sticky melancholia. A band born of Spacemen 3 (whose motto was “Taking drugs to make music to take drugs to”), Jason Pierce’s Spiritualized merged woozy drone with serious grooviness on this beyond-gorgeous cut—a veritable paean to Reed & Co.